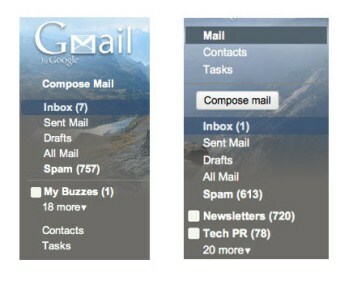 What’s new in Gmail Interface? Home / Cool Web Apps / What’s new in Gmail Interface? There are also a few new changes to the overall look of Gmail that makes it easier to quickly access your contacts and tasks list. At the top of the Gmail inbox is a new “Mail” link that takes you to your inbox when you click on it. Strangely, the Mail link does not include a count of your current unread e-mail. For that, you’ll still have to refer to the Inbox link below. The biggest change Gmail has implemented is a completely overhauled look to the contacts manager (click on the image above to see how it’s laid out now). 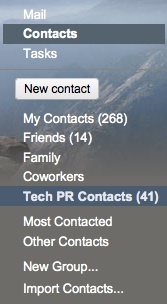 Your contacts are now organized horizontally across the screen similar to how your e-mail looks in Gmail. At a glance, you can see a contact’s name, e-mail address, phone number, address, and the names of any groups you’ve assigned to your contact. There’s also a link to a list of the people you contact most often, and another link for any contacts that are not assigned to any of your groups. The revamped Gmail is currently rolling out and you should see the new interface soon if you haven’t received it already. However, Google Apps users won’t be seeing the Gmail refresh just yet. Google says it is “actively working on making domain-specific features work well in the new interface.” But the company promises Google Apps users will get the new features soon. The Twitter Killer, Google Buzz-Complete Guide !! !